Biscotti also known as 'cantuccini' are the authentic italian biscuits. The word 'biscotti' means twice-baked, and these type of biscuits are baked twice in oven. Basically these are oblong shaped as well as dry and crunchy in texture. Due to baked twice, these are very dry and hence can be stored for a longer periods. The biscotti are served with a drink into which these are dunked and then consumed. But I like the crunchiness of biscotti, so I prefer as it is. These mainly resemble a lot with rusk texture wise, but taste wise biscotti are more crunchy due to addition of variety of nuts into it. 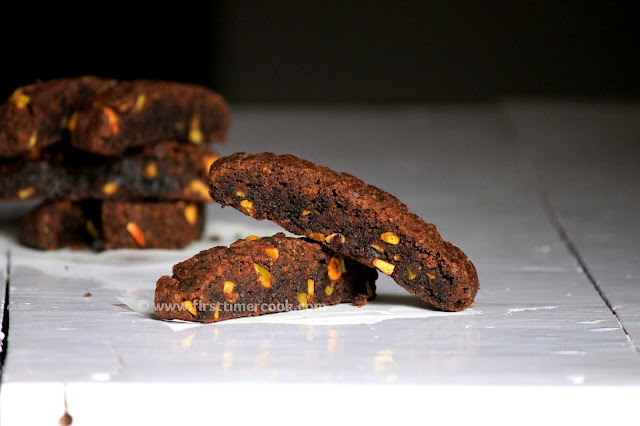 Now-a-days anyone can find a variety of biscotti in market. Here I have added chocolate and pistachio and no egg is added, hence the result is the eggless chocolate pistachio biscotti. So the step by step method of preparation are mentioned below. Whisk oil and powdered sugar in a bowl until a smooth texture. Then add vanilla essence, milk and whisk a bit more. Now add all purpose flour, cocoa powder, baking powder, coarsely chopped pistachios and chocolate chips. Mix everything well to get a sticky dough. Place the whole dough on baking sheet and shape into approximate 6 cm wide and 20 cm long log. Bake for 25-30 minutes or until firm to the touch. Remove from the oven and allow it to cool at least 15-20 minutes. Using a serrated knife, cut the log into 1 inch thick slices. Place the slices on their sides on the baking sheet. Bake for 10 minutes and take out. Flip them and bake for 10 more minutes. Remove from oven and transfer to a wire rack to cool completely. It will become even more hard after cooling. 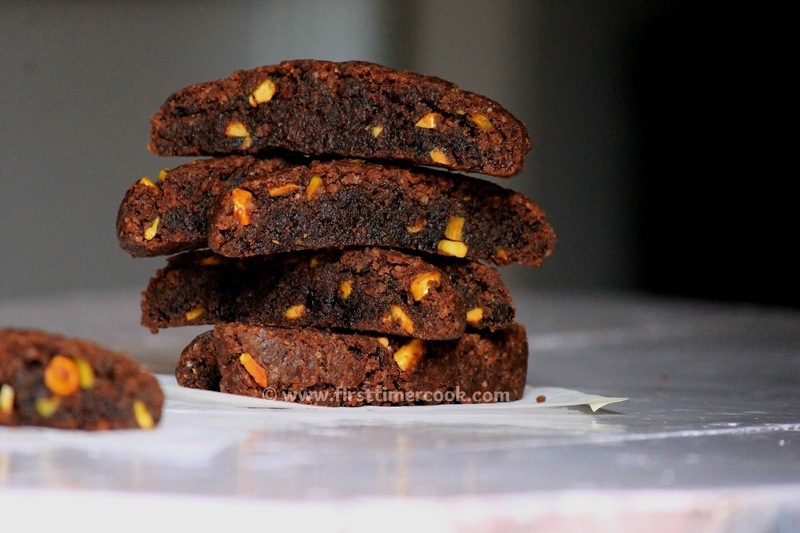 Serve these crunchy chocolate pistachio biscotti as an accompaniment with tea / coffee ! While slicing the baked log, keep patience and slowly slice out because it tends to break.